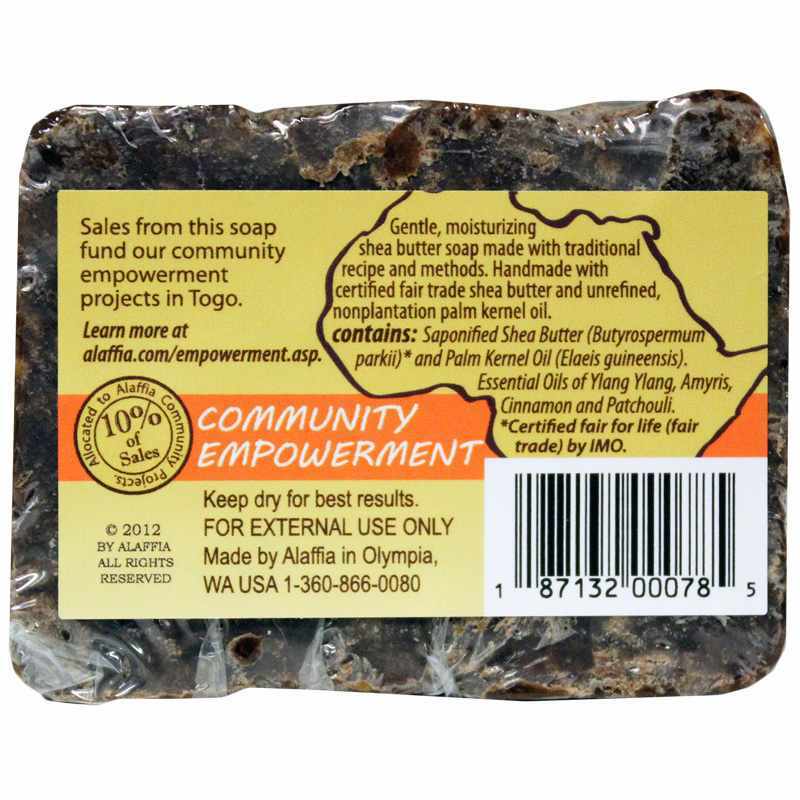 Black soap has been used in West Africa for centuries. The recipes and methods differ by region, but it is typically made from carefully dried and roasted plantain leaf ashes hand-stirred with palm oil and shea butter and then allowed to cure for several weeks. 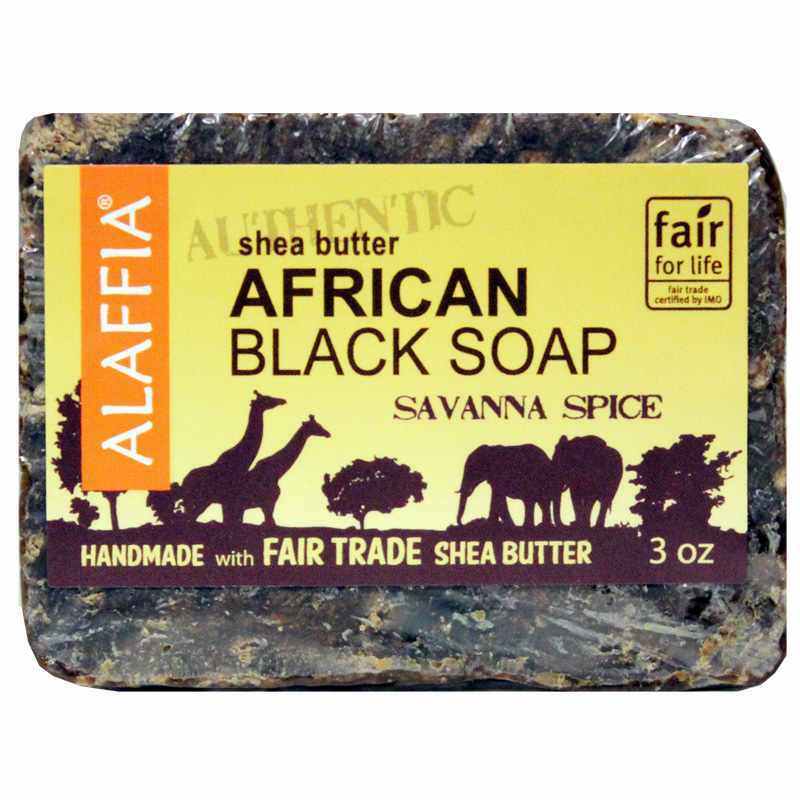 Shea Butter African Black Soap Savanna Spice from Alaffia is a richly moisturizing soap gentle enough for babies or people with sensitive skin. Made by hand from Certified Fair Trade unrefined shea butter, virgin palm kernel oil and potash from the ashes of plantain leaves and Agow tree bark. This pure, all-natural soap is scented only with natural essential oils of ylang-ylang, amyris, cinnamon and patchouli for a sweet, warm, spicy, calming aroma. Shea butter - this rich, creamy oil from the nut of the African Shea tree has been valued for its moisturizing, softening, skin protecting properties since Cleopatra's time. This pure, unrefined shea butter helps soothe, repair, smooth and cleanse skin without stripping natural oils. Unrefinted Palm Kernel oil - this rich, creamy oil contains lauric acid, which has natural antimicrobial and antifungal properties. It is rich in plant-fats which help nourish and moisturize while cleansing gently. This African black soap is handmade by the Alaffia cooperative using traditional methods, and pure, local and fair trade natural ingredients. It offers pure, gentle cleansing, moisturizing and skin softening for all skin types and has a warm, sweet, spicy scent. Order yours now! I bought this african black soap because I heard a lot of great reviews on it; however, I didn't realize this specific one had Cinnamon in it. Cinnamon can burn your skin and that's exactly what it did to mine. I used it once and it left my face a bit dry but I always have that problem. However, the second time I used it I notice my skin was burning horribly and I go to check my face a sure enough there was skin that was smooth almost like when you burn your hand on something and it leaves that tight and smooth skin. It's been two days since I've used it and it still burns. Don't buy it. I am in love with the smell and texture of this product! !